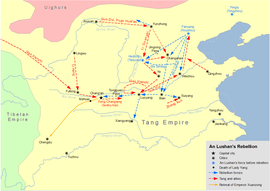 The An Lushan Rebellion wis a devastatin rebellion against the Tang dynasty o Cheenae. The rebellion begoud on 16 December 755, whan general An Lushan declared himsel emperor in Northren Cheenae, sicweys establishin a rival Yan Dynasty, an endit whan Yan fell on 17 Februar 763 (awtho the effects lastit past this). This page wis last eeditit on 3 Januar 2019, at 07:27.